IGH - Go anywhere. Bring anything. Internally geared hubs make sense for winter riding. We've been around the planet(ary gears) for a while, so let us recommend an appropriate upgrade for you. Internally geared hubs (a.k.a. planetary or epicyclic gears) house multiple gears inside the shell of the hub itself. This contrasts with external, or derailleur gears, which rely on a mechanism to shift between multiple cogs or gears that are fully exposed to the elements. 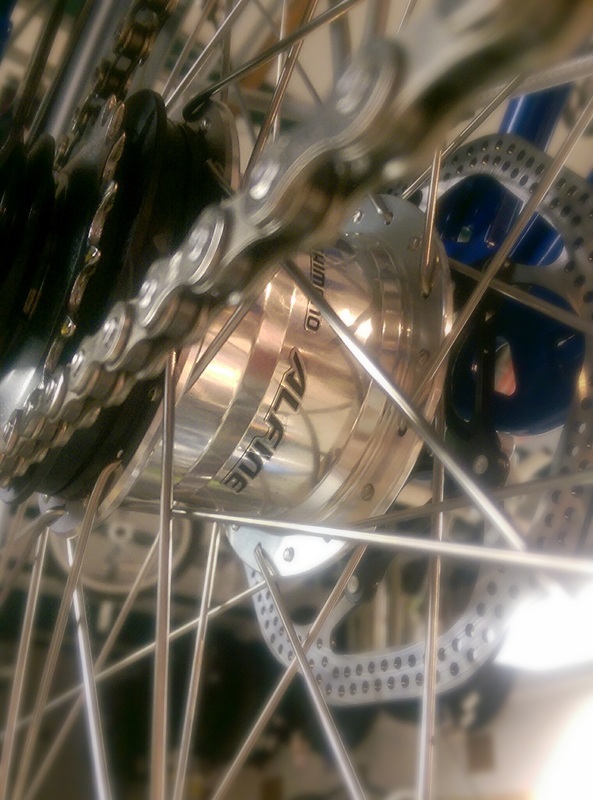 One advantage of internally geared hubs (IGH) is the protection afforded by the hub shell. Often the internals are sealed well against intrusion of water and dirt, extending the service cycle and durability of the mechanism. Although an IGH system is usually a bit heavier than its derailleur-compatible counterparts it's often advantageous to be able to shift gears while standing still (since lifting the rear wheel to shift is cumbersome or impossible with significant payloads carried by cargo or touring bikes). This ensures you can push off from a stop in an easy gear, something that can be accomplished with most internally geared hubs, but not with derailleurs. The hub pictured here is a Shimano Alfine 11-speed disc brake model. We spec it on lots of cargo and commute bikes because of its reliability and relatively low cost-to-performance ratio.